Central American fusion with killer cocktails. 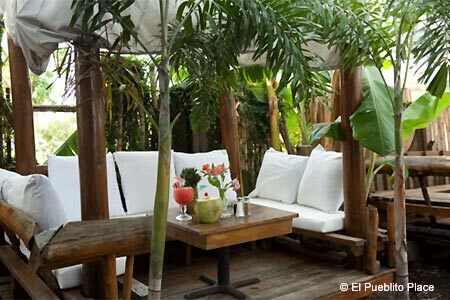 : What was once a small eatery with tasty dishes from Guatemala and Mexico designed by owners Eduardo and Monica Lopez has morphed into a tropical paradise since the couple outfitted the parking lot with cabanas, banana trees, tiki torches and a rock waterfall. Food-wise, we like the snapper Santa Monica marinated with lemon butter and served with a fresh fruit relish, pinto beans and rice, and the grilled chicken breast topped with spicy chipotle sauce. Both are served in heaping portions, which you need to remember before filling up on the thick, homemade tortilla chips and pineapple salsa. Margaritas are a mainstay, but those looking for a resort flair order the “cocoritas” served in coconut shells with the requisite tiny umbrella. Latin ensembles and flamenco artists add to the food fiesta in the evenings.